Georges de Feure (originally Georges Joseph van Sluijters) was born in Paris, France to a Dutch father and Belgian mother. De Feure was an artist and designer but turned his attention to aviation after Louis Blériot made his historic flight across the English Channel on 25 July 1909. Armand Deperdussin was born in Belgian but lived in Paris. Deperdussin had made a fortune importing silk for French stores. Like de Feure, Deperdussin had become interested in aviation after Blériot’s Channel crossing. In 1909, the two men joined forces to build aircraft; de Feure was the designer, and Deperdussin provided financial backing. The Deperdussin-de Feure model 2 hangs in the Au Bon Marché department store in Paris. Note the number “2” on the aircraft’s nose and the single landing skid. Many sources refer to the partnership as De Feure-Deperdussin (DFD) and call the aircraft DFD1 and DFD2. However, a French patent for the for the pair’s second aircraft cites the business as the Société A. Deperdussin et de Feure, or the A. Deperdussin and de Feure Company. This substantiates other sources that refer to the association as Deperdussin-de Feure, which will be the name used in this article. Subsequent patents listed Deperdussin and de Feure individually and include Louis Béchereau when applicable. Béchereau was an early French aeronautical engineer who was hired to assist with Deperdussin-de Feure aircraft design. 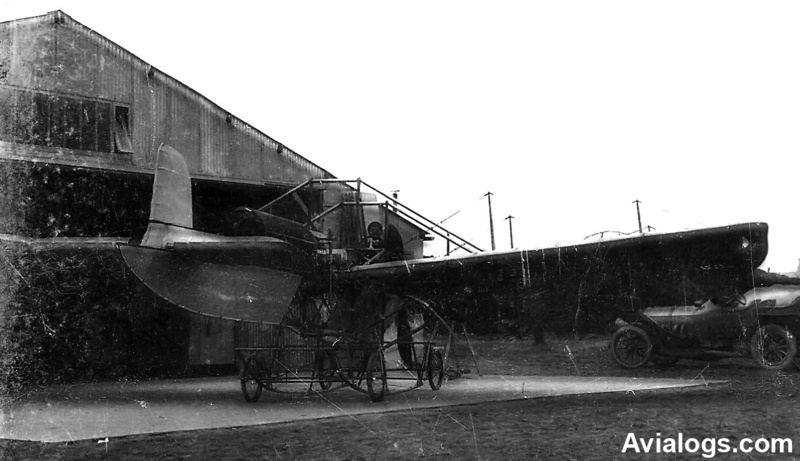 The first aircraft designed by Deperdussin-de Feure has been described as a pusher with an arrow-shaped wing. This aircraft was not built, but it did serve as the basis for the pair’s second aircraft. Deperdussin-de Feure applied for a patent on 19 November 1909 that described their second aircraft; they were granted French patent 409,715 on 24 February 1910. This rear view of the Deperdussin-de Feure suspended over the store’s toy department shows there is no engine installed in the aircraft, and the wing is absent of flight controls. Note the two wide, two-blade, contra-rotating propellers. The Deperdussin-de Feure model 2 aircraft was a pusher design that had a rear main wing and a front canard. The tail-first aircraft was made up of a wooden framework covered with fabric. In the middle of the fuselage was a radiator to cool the water from the four-cylinder engine. The radiator consisted of numerous copper tubes that arched from one side of the aircraft to the other; the radiator was modified several times throughout the life of the aircraft. The engine was enclosed in a metal cowling and sat just behind the radiator. Reportedly, the engine produced 65 hp (48 kW) at 2,300 rpm and weighed 165 lb (75 kg). The manufacturer of the engine is not known, and its specifics do not match any engine from the time period. However, the engine does resemble four-cylinder engines built by Panhard-Levassor around that time, although the Panhard-Levassor engines produced peak power at a lower rpm and were heavier. A propeller shaft extended from the engine, traveled under the pilot’s seat, and terminated at a gearbox in the rear of the aircraft. The gearbox transferred the engine’s power to a set of contra-rotating propellers. The patent noted that the contra-rotating propellers would cancel engine torque and increase the aircraft’s stability. The patent also stated that the pitch of the rear propeller was greater than that of the front propeller to make efficient use of the increased airflow generated by the first propeller. Originally, two two-blade propellers were installed, but these were later replaced by two four-blade propellers. According to the patent, the curvature of the wings’ inner sections could be warped symmetrically by the pilot to increase lift or drag. The outer sections of the Deperdussin-de Feure’s wings could be warped asymmetrically for roll control. The aircraft’s canard featured an all-moving elevator with an all-moving rudder positioned above. The extensive trusswork for the Deperdussin-de Feure’s wings is displayed in this photo. The inclined track for the wing can be seen in the middle of the photo, just behind the first truss. Note the two two-blade propellers. While the patent drawing shows a passenger seat mounted between the pilot’s seat and the engine, it does not appear that such accommodations were ever installed. The pilot’s seat was essentially mounted on top of the fuselage. A wheel in front of the pilot controlled wingtip warping for roll control. Wheels mounted on either side of the pilot controlled the elevator and inner wing warping. The rudder was controlled by a foot-operated bar. The aircraft was supported by four wheels attached near a skid under the aircraft. The front wheels were steerable, and when the aircraft landed, all the wheels would pivot upward, allowing the skid to contact the ground. 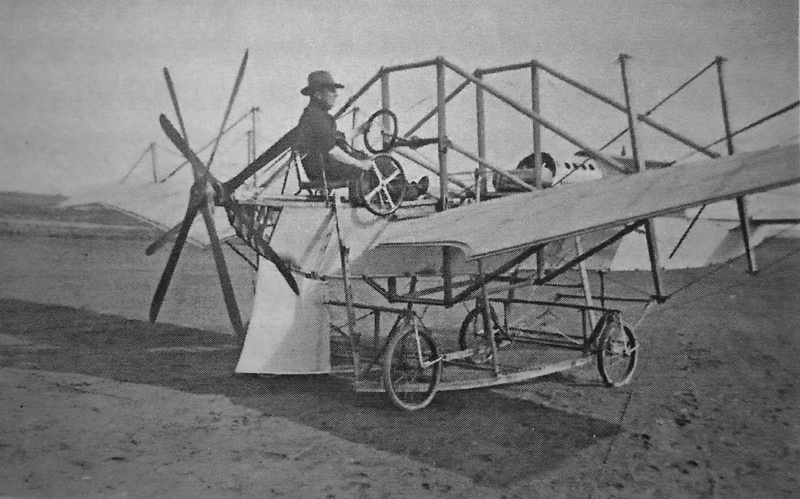 The friction created by the skid would slow the Deperdussin-de Feure aircraft to a stop. Originally, the aircraft had one skid, but a second was added later. 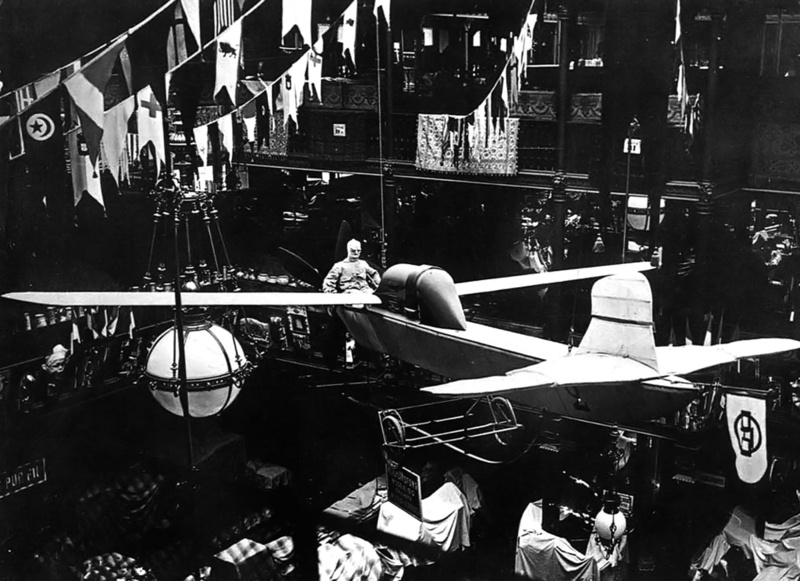 Appearing mostly complete, the Deperdussin-de Feure aircraft was displayed at the Au Bon Marché department store in Paris starting 12 December for the 1909 Christmas season. However, the aircraft lacked its engine, and 26 ft (8 m) long fake wings were installed just for the display. The aircraft was suspended from the ceiling above the store’s toy department and had a mannequin in the pilot’s seat. The aircraft’s unfinished components and its location above the toy department gave rise to the belief that it was just an elaborate model, and in a sense it was. The Deperdussin-de Feure ready for a flight attempt. It is difficult to determine which propellers are installed on the aircraft in this photo. After the display, the aircraft was moved to a hangar at the Chambry airport 95 mi (150 km) northeast of Paris in March 1910. The hanger had been specially built and was designed and equipped under the supervision of Louis Blériot. By this time, the aircraft’s engine was installed, and an additional landing skid was added. With a span over 39 ft (12 m), the Deperdussin-de Feure’s true wings were fitted along with their wooden support trusses. The many changes incorporated gave rise to the belief that this was a different aircraft than the one displayed in the department store, and in a sense it was. With the design of the new wings and their support trusses, the idea of increasing the wings’ lift by altering the curvature of the inner wing sections was discarded. A new method to increase lift was devised that altered the position and angle of the entire wing. Outlined in French patent 413,071 (applied for on 26 February 1910 and issued on 18 May 1910), each wing was attached to the aircraft’s fuselage via an angled track. The trusses held the left and right wings together, and the track allowed the wings to shift position relative to the fuselage. As the wings moved fore or aft, so too would the aircraft’s center of gravity. The track was inclined toward the front of the aircraft. As the wings moved forward, their angle of attack would increase, altering their center of pressure. Exactly how the system was operated is not recorded, and one can only imagine how wings shifting in position and angle would affect an aircraft in flight, especially in the early days of aviation. The Deperdussin-de Feure aircraft has now been modified with a ventral rudder and two narrow, four-blade, contra-rotating propellers. The Deperdussin-de Feure aircraft was made ready for flight, and claims were circulated through the press that it could carry 661 lb (300 kg), had a 4,920 ft (1,500 m) ceiling, and that the military was interested in the machine. Many bystanders from nearby Laon would come out to Chambry in the hope of seeing de Feure pilot the aircraft into the air. Unfortunately, they were rewarded with only small hops of no more than 1.6 ft (.5 m). Four-blade propellers and an auxiliary, all-moving rudder positioned below the pilot were installed sometime during this period. In addition, a conventional cored radiator was tried. Tests at Chambry continued into June 1910. The aircraft was then moved to the Rheims airport 30 mi (50 km) southeast of Chambry, but a successful flight was still not achieved. Frustrated by the lack of success, Deperdussin and de Feure had gone their separate ways by the end of 1910. Deperdussin started another aircraft company with Béchereau as the head designer. The company became the Société Pour L’Aviation et ses Dérivés (Society for Aviation and its Derivatives), better known as SPAD, and created some of the best aircraft of World War I. De Feure returned to his roots of design and artistry. Although he did envision a few other aircraft, only those meant as theater sets and costumes were constructed. This rear view of the Deperdussin-de Feure displays the aircraft’s wing trusses, propellers, flight controls, and all-moving ventral rudder. This entry was posted in Aircraft, Through World War I on 17 December 2015 by William Pearce. That is one bizarre looking plane – it looks like it is going in reserve. If I was the pilot, I’d be worried about having two propellors spinning just behind my back!